I was very honoured to be asked to take over as Chair from Bob Duncan and I would like to pay tribute to the support that Bob provided in the role of Chair during the period when he was also holding the office of Lord Provost for the city. The organisation has been handed over in good shape and that is probably the highest tribute that could be paid to any departing Chair. Annually, over 3,000,000 attendances are recorded at our facilities – a staggering footfall in a city with a population of less than 150,000. In the same period, Leisure & Culture Dundee has generated cumulative savings for Dundee City Council in excess of £14,000,000. 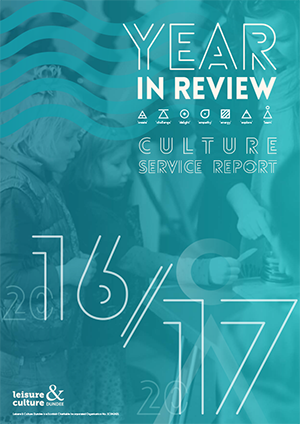 In the 2016/17 year, Leisure & Culture Dundee delivered a higher level of output for 30% less cost to Dundee City Council than when it delivered the services six years ago. By any measure, these are results which, as the new Chair, give me great satisfaction.  Looking back over 2016/17 there have been many highlights: the arrival of the brown bear cubs at Camperdown Zoo; our support for Dundee’s designation as the UK’s first UNESCO City of Design and our role in hosting the first Dundee Design Festival; the development of our partnership with Macmillan Cancer Care for the Macmillan@ Dundee Libraries Project; and our partnership with The British Museum and National Museum for Scotland, “Reflection on Celts”, which was very well received by visitors, and content was shared online by an additional 20,000 people. 2016/17 was also the year when Moira Methven, one of our Board, received her MBE in recognition of the services she has provided to the public library service locally in Dundee, where she worked for the majority of her career, to the National Library of Scotland and the Scottish Library Information Council. Leisure & Culture Dundee delivers a huge range of services to children and young people. From pre-birth to early years, from primary to secondary school, and into young adulthood. Our facilities are open for 361 days per year with programmes start at 6.00 am and they end at midnight; our buildings get heavily used. Our objective simply is to provide opportunities for physical activity, active learning, cultural engagement, and fun. Most of this happens with the support of parents or carers, but there are some children who need more support and who would not get access unless there was targeted intervention in their lives. In most cases, we rely on others to help us make these targeted interventions. For example, the funding we receive from Macmillan Cancer Care, sportscotland (Active Schools), the Northwood Trust, Coca-Cola, and Dundee City Council. In many cases Leisure and Culture Dundee has been able to enhance programmes by using profit that has been generated by trading activity and reinvesting it in its social and charitable purposes. For examples, by funding a discount access scheme to swimming, sports and other facilities, and by sponsoring places on the Soundbase Workshops, etc. To encourage children and their families to get the best experience growing up in Dundee, by playing and learning together. We want to create safe, attractive, stimulating, and challenging experiences, which will make young people happy and more capable and which will help them to become resilient adults. To do this, we promote activities which are interesting, affordable, accessible, and which promote collaboration and integration. We put a strong emphasis on working with young people, particularly as they become young adults, giving them responsibility for developing or co-creating programmes with us. Today we run community provision in 7 of Dundee’s secondary schools. We have expanded the programme, we have increased attendances, and we have done this at a significant saving to Dundee City Council. During 2016 Active Schools and Outdoor Learning programmes were transferred into Leisure & Culture Dundee, creating a more robust school and community pathway for physical activity. Today, young people in Dundee have better opportunities than ever before to gain free access locally to the benefits of library and information services, to sport and physical activity, and to cultural opportunities. There will be very few young people growing up in Dundee that do not, on a weekly basis, have some form of contact with the services provided by Leisure & Culture Dundee. We have recently carried out an audit of what these services look like and what we offer to every child growing up in the city. We could look at this as an entitlement. We know that better off families with supportive parents help their children to access these opportunities. Our challenge is to extend that offer to looked after children and to children whose parents or carers are less motivated to give them access to these opportunities. To do this, we need the active support and collaboration of partners, particularly colleagues from the City Council’s Children and Families Services. You may be aware that Scotland has been placed joint last in a recent international study of physical activity among young children. 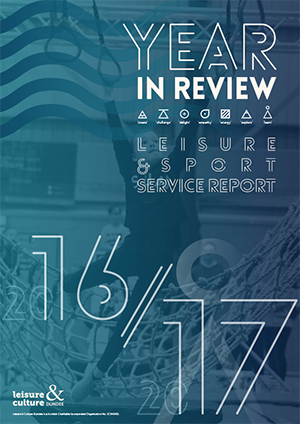 This is despite having the second highest rated policies for physical activity, one of the best environments and infrastructures for play and excellent availability of leisure centres, swimming pools and gyms - all recognised in the same report. participation levels for children engaging in play and sporting activities. Additionally two thirds of Scotland’s population is overweight - that’s 100,000 Dundee citizens.One of Scotland’s major health challenges is mental illness. It is estimated that more than a third are affected by a mental problem each year with the most common conditions being depression and anxiety. That equates to some 50,000 people in Dundee every year and the prevalence is disproportionate to those facing the greatest socioeconomic challenges. A significant number of those affected also experience extreme poverty, unemployment and debt, substance misuse and domestic violence and the incidence increases as people grow older. Scotland also faces an increased number of cancer diagnoses annually. In 2014 11,500 non-melanoma skin cancers and some 32,000 other cancers were diagnosed. In the preceding 10 year period diagnose rates increased by 6% for women and 3% for men. There are therefore major health issues facing the people of Dundee. In response, Leisure and Culture Dundee offers opportunities for the whole population to improve their wellbeing. We also target a range of designed provision for particular groups. The McManus offers a twice weekly out of hours Creative Campus evening for community groups, partners and museum staff to meet, talk and share ideas: enhancing capacity building and connectivity and helping tackle social isolation and increasing a sense of community. Children and adults have been encouraged to improve their self-confidence and citizenship through family focused Day to Play initiatives. These are free interactive performance workshops provided in partnership with Shaper/Caper: probing mental agility by setting out stimulating problem solving exercises. It is recognised that participation in choirs improves wellbeing across a number of areas. Cultural Services engages with, and supports 3 choirs in the city with over 200 people taking part each week. As well as Loadsaweeminsingin and Dundee’s Got Soul choirs, Cultural Services organises Leisure and Culture Dundee’s workplace choir - in partnership with the RSNO. Leisure and Culture Dundee wants to be an organisation with a focus on staff wellbeing. Cultural Services provides a number of projects targeting families: for example, dance and physical theatre was the focus of the Big Draw Event with industrial heritage inspired choreographed dance pieces. The behind the scenes tours opens up unseen parts of the collections unit, the art stores and the Caird Hall allowing people to explore the collections and facilities. These include a 160 foot, 232 step, climb to the top of The Old Steeple - that’ll keep you fit! The Library Service also provides a valuable contribution to people’s health and wellbeing. At the entry level for the Service, there is substantial evidence of the contribution reading makes to an individual’s wellbeing and ability to achieve going through life. However, the Service also provides more specialised services including the Dementia Library, opened in 2016. It provides access to information, resources and group activities for people living with dementia, their carers, family members and people working in dementia care in a much more relaxed, non-clinical environment. Equally, the Reminiscence Sessions have proved very beneficial for people experiencing memory loss. Other Specialist Collections have been developed to support carers of, or people living with dyslexia, dyspraxia, autism and those using makaton. Library staff are trained to ensure they can assist individuals and families in using the resources and to signpost to other agencies and networks who can provide further support. More generally, collections of books are available on pain management, health and self-help to support people looking to improve their quality of life and overall wellbeing. Reading groups are well established at all thirteen branch libraries. They offer members a social setting to enjoy group interactions and improve literacy. Members of the groups often become sources of support for one another helping to reduce isolation and loneliness. Libraries also indirectly support a range of people with health related conditions by providing community spaces to partner organisations such as Health and Social Care to meet their clients. Local libraries act as a collection point for Blue Badges and provide rooms for self-help groups to meet. The Leisure and Sport Service now has a dedicated Health and Wellbeing team which delivers a wide range of activities to promote long term benefits to the city’s people and local communities. The team organises and provides programmes targeting medical recovery, fitness awareness raising and building an active lifestyle. The Active4Life programme has in excess of 1,500 referrals from a range of client bases - people with long term health conditions, prisoners on liberation, street soccer volunteers, young carers and looked after children. Our partners include, NHS Tayside, Dundee City Council, Scottish Prison Service, Dundee Carers Service and Positive Steps. The programme promotes active lifestyles for individuals facing particular challenges, many with multiple challenges and supports other recovery focused interventions. The re-imagined Family Active programme has over 400 referrals and 150 members receiving access to various pools throughout the city for £1 per family - no matter the size. This programme has received national recognition for tackling poverty and improving family and community cohesion. As well as the work McMillan does with the library service, it also works with the Leisure and Sport Service. The Move More Dundee programme is a free 12 week physical activity programme aimed at getting anyone living with or beyond cancer to be more physically active. There are 4 peer support options: circuit classes, health walks, gardening and gentle movement. Referrals have increased during the last year and there is now a 60% follow on into the Active4Life programme after the initial 12 weeks - 50% better than the national average. In partnership with charity Street Soccer, the Health and Wellbeing team has engendered “hope” to many young people in the city with their involvement in coach education, vocational training and confidence building. The programme promotes employability and tackles homelessness. Local green spaces are activated by the ParkLives programme. Free fun activities are provided from Easter till October and include health walks, outdoor zumba, family tennis, cycling, archery, mindful walking and much more. The programme’s focus is to get the inactive, active. Finally, with over 15,000 attendances during 2016/17, mainly teenage girls, the dance programme is a vibrant success. It aims to keep young people engaged in physical activity who otherwise would not participate and its main focus is young women, who “statistically’ are more likely to give up activity at the end of primary school. Notwithstanding all of this successful targeted work, our facilities and services are available for all Dundee people almost every day of the year, with opening hours as early as 6.00 am and closing after midnight, many of them are free or provided with concessionary pricing and operate throughout the city, in every locality. We see over 3 million visitors every year and there is something for everyone - and even if we don’t deliver it directly, we can facilitate it. We host international sporting events, nationally significant exhibitions and unique author events - and we also work with individuals facing various challenges and support aspiring communities - both of interest and geographic. We try to ensure our services are accessible to, and enjoyed by all. As we are all very much aware, Dundee as a whole has a significant percentage of areas of deprivation. According to the SIMD 2016, Dundee is one of the five local authorities with the largest proportion of datazones in the 20% most deprived. This is not just in relation to income, but also about employment, health, education, geographic access to services, housing and crime. Leisure and Culture Dundee has a clear purpose in ensuring that our customers can access the services we provide, regardless of their circumstances. Through the programmes we deliver, the projects we establish and the partnerships we create, L&CD has a clear focus on inclusion. A high number of the services that we deliver are free at the point of access which is crucial to people who are experiencing poverty. We provide free Wi-Fi and Internet access together with free IT training and support to ensure that job seekers, benefit claimants and anyone digitally excluded is able to go on line. This is essential in a society which is increasingly moving to a digital by default agenda. Free access to our museums provides a crucial means of viewing exhibitions at a local level to those without the financial means to travel to venues in Glasgow, Edinburgh or London to see the same exhibitions. Projects such as ParkLives, in partnership with Coca-Cola, gives a framework of free access to healthy activities in local venues. This is a key method of inspiring individuals and families to recognise the benefits of a healthier lifestyle. Over 2,000 attendances last year. Activities to suit everyone’s needs and ability levels bringing together diverse groups and ages in a fun, open atmosphere. Concessionary access is available to our sports venues and programmes for those on low incomes and direct delivery, in kind support, training and equipment is provided to a number of charitable causes and community groups such as Dundee International Woman’s Aid, local sport clubs, looked after and accommodated children. 191 children and young people living in poverty accessed holiday provision through the SummerActive Project. At the heart of what we do is a recognition that there are barriers preventing people from using services which can make a difference to their lives. Our aim is to breakdown these barriers by working with a range of partners so that services can be targeted to reach the right audiences. Through working with nurseries, schools, the NHS and other third sector health providers we identify groups who can benefit from accessing the services we provide. For example, we are working closely with Macmillan to deliver Move More sessions to people with a cancer diagnosis, as well as setting up Macmillan hubs in libraries to give support away from a clinical environment. We visit people who are unable to leave their homes to take services to them and are often one of the few visitors the customer receives. This brings much needed social interaction and the chance for wider issues to be raised, where we can signpost other agencies to provide support. The first Go for Gold event was held in Dundee last year providing 44 Dundee care home residents the chance to take part in new, light, fun activities in a semicompetitive environment. Working with third sector providers and members of the Health and Social Care Partnership, we provide a welcoming, supportive experience to people with additional support needs. Specialised sessions are delivered through a range of our venues. For example Kingspark School has access to McTaggart Regional Gymnastics Centre and there is free access for wheelchair users to Dundee Ice Arena. In Central Library, there is a regular programme of events and activities including local history sessions, craft activities and storytelling sessions for local groups. 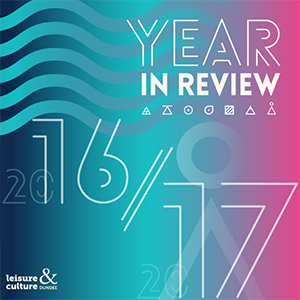 Over the coming year, Leisure and Culture will continue to establish and deliver quality services which are accessible, relevant and responsive. We will work with our partners to ensure that we continue to address inclusion priorities target key groups living in Dundee. Our purpose statement is to deliver, for the citizens of Dundee, and those who visit the City, high quality Leisure, Sport, Cultural and Learning Experiences which improve their quality of life. Quality of life is the general well-being of individuals and societies. It observes life satisfaction, including physical health, family, education, employment, wealth, religious beliefs, finance and the environment. Quality of life should not be confused with the concept of standard of living, which is based primarily on income. Across our three service areas and throughout the city, we make improving people’s quality of life central to what we do, and we are committed to provide high quality, consistent and customer focussed access to our resources and to the services that we deliver. Much of what we provide is free, and we have concessions that support the most vulnerable to ensure access and engagement across our communities, actively promoting inclusion. And of course we always aim to deliver “best value”. The network of libraries and sports facilities across Dundee ensures that people have this access to services and facilities at a local level. The provision of a comprehensive selection of books at all libraries ensures that material displayed is attractive, current and appealing to customers. Through this we aim to inspire reading across all interests and age groups. Recently 3D Printers have become a key resource and are used to great effect with a range of audiences. In terms of swimming – Research has indicated the earlier a child learns to swim the better they are with coordination, self-awareness and social interaction. Leisure and Sport sees over 50s engaging in swim jog and lunchtime lane swim sessions and appreciating the social aspect of swimming. Lochee community pool has gym fitness classes and water based activities, including the provision of tuition for pre-school and school age children and adults. Active Women and Active Men sessions are provided where opportunities were previously not accessible due to cultural or faith barriers. These sessions are successfully promoting social interaction, relaxation and health benefits. We also manage some of Dundee’s best loved and most visited attractions including The Caird Hall, the main concert venue in the city which contributes significantly to the cultural life of the Dundee. In a wide and ranging programme, The Trad Awards were a highlight of the year with musicians from all over Scotland participating, and Music Development’s St Andrew’s Day Fusion Festival included workshops and a celebration of the different cultures that make up modern Dundee. Our Music Strategy for the city is being developed in consultation with over 600 individuals 30 partner organisations across this city plan to launch in June. Focusing on growing opportunities for musicians and venues, developing audiences and improving promotion. Voted Dundee’s best loved building, the McManus is currently celebrating its 150th anniversary year, with a varied exhibition programme including our recent partnership with The British Museum and National Museum for Scotland Reflection on Celts. This was very well received by visitors and we were able to share content online with an additional 20,000 people. This year at McManus, community engagement has been delivered through a programme called The People’s Story. We are all about making a positive impact on health and well-being for people to engage with cultural heritage and tell ‘their own story’ of what the museum means to them through a blend of art, dance, music, theatre, film, written and spoken word. The city’s Art and museum’s collections are held in trust for the citizens of Dundee and are recognised as being nationally significant and our loan programme illustrates the importance of our collection with work going on display in Edinburgh, London, and Paris already this year with work going to Barcelona, Madrid and Kyoto in Japan later this year. This helps enhances Dundee’s reputation as an internationally recognised city at the heart of a vibrant region. At the central library, our Local History Service provides access to information relating to Dundee’s heritage, culture and history. Speicalist library staff answer detailed genealogical and local history enquiries at local, national and international levels facilitating access to an impressive collection of unique material which attracts worldwide attention. On a lighter note, we were a key partner of the Oor Wullie Bucket Trail - promoting and offering activities to encourage ‘Bucket Trail’ audiences to visit and explore our galleries and collections at the McManus, Mills, Broughty Castle and our library network across the city. This fantastic initiative which brought people together from across the city for selfies and conversations and at the same time raised money for a great charity. A real fun way to contribute to our collective Quality Of Life! Leisure and Culture Dundee are the lead agency for the management and delivery of Dundee’s Place Partnership, a three year cultural development programme funded between Creative Scotland and Dundee Partnership and supports the delivery of Dundee’s cultural strategy. As you will be aware, Dundee was given its status as the only UK City of Design and in the last two years the significance of that designation has become increasingly important. The 22 other global UNESCO design cities provide an incredible network for Dundee to be a part of and contribute to. Dundee will have the V&A Museum of Design and has piloted public sector redesign through a social design academy, DJCAD is the top performing arts school in Scotland and one of the top in the UK. 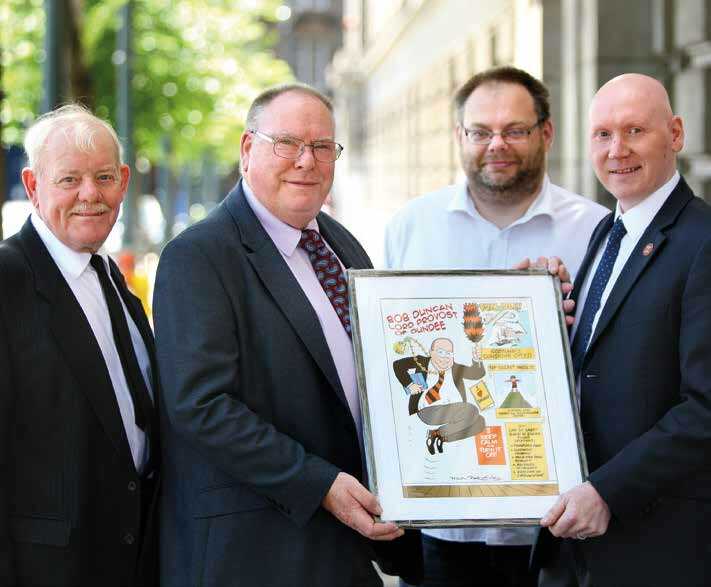 For Leisure and Culture Dundee hosting and managing the designation on behalf of the city is an important responsibility and we recognise how significant this is in contributing to the wider quality of life to the citizens of Dundee and to our visitors. Leisure and Culture Dundee is also the focal point for the development of Dundee’s Bid to become the European Capital of Culture in 2023. Significant external funding from Government, the City Council and private sector has allowed us to progress the bidding process. Securing this designation would be a major contribution to the quality of life across the city and region and continue our contribution to the culture led regeneration of the city. So in finishing, since becoming a charitable organisation in 2011 our strap line has been “Putting Quality into Life” and it is central to what we do. We know we are delivering because of the positive feedback we get from our visitors and participants across our network of facilities. Our organisational purpose is to deliver on Quality of Life. Since our inception in July 2011, Leisure & Culture Dundee has evolved as on organisation, and as part of this evolution, the Leisure & Culture Dundee Board has made a number of decisions to invest in areas that help to develop our facilities and services in order to enhance the customer journey and experience when visiting our facilities, to meet our charitable purposes but to also enable us to deliver services on behalf of Dundee City Council so that it meets its Single Outcome Agreements. £125k towards an ICT action plan and W-Fienhancement in all L&CD buildings – it was recognised that, in the current financial climate, all L&CD ICT requirements could not be met by Dundee City Council through our Service Level Agreement, so the Board agreed to invest in upgrading current systems and introducing new initiatives, such as handheld devices to track performance progress of children through the Learn 2 Swim programme. £100k towards development of Apprenticeships, Internships and Graduate Trainee posts, linking in to Dundee City Councils employability programme for young people of Dundee. £50k was made available to enhance the programme of replacement lighting at Caird Hall as part of Dundee City Councils capital works programme. £53k has been set aside for the purchase of new furniture and reception desk at Lochee Library, again to enhance the capital works being undertaken by Dundee city Council at the library. The Board also committed £250k towards the ambitious project of building a community wing as an extension to Broughty Ferry Library. £125k towards the Place Partnership Programme in Dundee over a three year period, a city wide project to celebrate the culture and creativity of Dundee delivering a series of initiatives and ambitious projects to encourage creativity in communities. £80k to refurbish the sauna and steam rooms at Lochee Swim & Leisure Centre as part of a bigger refurbishment of the changing area at the facility. £100k to replace signage at all Leisure & Culture Dundee venues making the organisation and what it delivers more visible to the citizens of Dundee. The surpluses generated over the past five years by Leisure & Culture Dundee since our inception has been against a backdrop of reducing management fee from Dundee City Council to deliver the same, and in some cases, enhance services, as agreed in our Service Level Agreement. This has been a real challenge, however we have increased income generated through increase in customers over this period through the quality, diversity and expending services we continue to deliver. 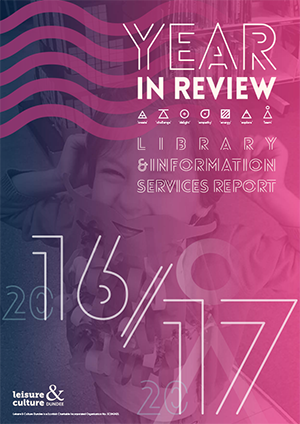 2016-17 was a significant year for Leisure & Culture Dundee as it was the first year since inception that the income generated by the organisation exceeded the management fee received from Dundee City Council for delivery of the services. This income included various sources of external funding, which we have tapped into in order to enhance the core services we deliver, but also to offer new services such as Coca Cola Parklives, the Macillan funded referrals programme and Northwood Trust. The external funding received by Leisure & Culture Dundee has risen significantly over the past five years and it is an area the organisation continues to actively pursue in order to enhance and increase the services and facilities available to the citizens of Dundee. It is with a tinge of sadness and a huge amount of pride that I stood down as Chair of Leisure & Culture Dundee. Having previously acted as the Convener for Leisure and Communities, and in that capacity taken on the role of Chair of Dundee Leisure, and subsequently supported the formation of Leisure & Culture Dundee, I have come to know the staff, the services and many of our service users well on a personal basis. Leisure & Culture Dundee was the first Scottish Charitable Incorporated Organisation of its type – a charity which had the benefits of incorporation limiting the liabilities of its trustees. We viewed it as a simpler and more direct way of governing those areas of service which were to transfer from Dundee City Council and from the Leisure Trust into the new organisation. From the outset Leisure & Culture Dundee has benefited from having a strong independent Board which understood the importance of the relationship with the City Council as its main backer and landlord. In the period since it was established in 2011/12, other functions have been transferred by Dundee City Council to Leisure & Culture Dundee. The Dundee Ice Arena Trust was brought into the organisation, Active Schools and the Outdoor Learning Service have also transferred to Leisure & Culture Dundee. We were asked to host the support team for the UNESCO City of Design and the Place Partnership Programme. On each occasion, these changes have delivered efficiencies and benefits for service users. However, all good things come to an end and after ten years in this role, five with the SCIO, I am delighted to have passed on the Chairmanship to my Vice-Chair Sinclair Aitken OBE. I am also delighted that Stewart Hunter has been prepared to take over the role of ViceChair from Sinclair. Between them and the capable and committed management team of Leisure & Culture Dundee, I feel our services are in good hands and, while I know there will always be challenges, I look forward to watching Leisure & Culture Dundee continue to make a major positive impact on the quality of life for those who live, work or visit this city. I wish all associated with Leisure & Culture Dundee continued success. The key challenge for both the Senior Management Team and the Board of Leisure & Culture Dundee is to continue the enormous strides which have been made through the partnership between Leisure & Culture Dundee and Dundee City Council. This is a partnership which is based on maximising the benefits which accrue from the independent charitable status of Leisure & Culture Dundee, with an active and committed Board, alongside the relationship with a local authority which, as landlord and core funder, retains a close interest in both the quality of services provided and the performance of the SCIO. This partnership will inevitably be tested as public finances are stretched and as the capacity of Dundee City Council to meet its Service Level Agreements with Leisure & Culture Dundee comes under greater pressure. Our response to these discussions will be to maintain an open dialogue where, if possible, we will generate more income, save expenditure and continue to meet the social and charitable objectives we were established to focus on. On a cross-service basis, Leisure & Culture Dundee has looked at each of these themes and analysed what is currently provided and in what areas there is scope for further development. In relation to capital projects, we were disappointed at the delay in progressing with the Regional Performance Centre for Sport but are delighted that planning permission has now been granted and that the building of the RPCS is to go ahead in Caird Park. The Board hope to complement this development with improvements to the golf offer and to the development of a golf driving range adjacent to the RPCS which it plans to fund independently. There has been a very positive public response to the proposal to create a community wing at Broughty Ferry Library. Funding this project represents a significant challenge but, at this stage, we are encouraged and will continue to work with partners towards that objective throughout the forthcoming year. Plans by Historic Environment Scotland to replace windows and to carry out to the improvement work to the external façade of Broughty Castle. Improvement in our marketing of services and programmes on offer. Development of new species and new enclosures, and our important breeding programme at Camperdown Wildlife Centre. Reviewing and updating our ethical and environmental policies. Further commitment to building on programmes which target the most vulnerable in our society, either through creative learning, the role of the Public Library Service, or through the delivery of programmes designed to promote health and well-being.